Fitting a bathroom can take anything from 4-12 days depending on how complex the design is. It is very easy to take the old bathroom suite out but installing a new one takes a lot longer. The more tiling there is to do the longer the fitting process takes. Also, plumbing pipework often needs to be altered for the new suite. Yes, we’re based in Middlewich but cover the Middlewich, Northwich, Sandbach, Holmes Chapel and Knutsford areas. Again, this can depend on how much work is involved and the materials needed. To give a typical example, an average bathroom will require tanking membrane, tile adhesives and grouts, plumbing fittings and assorted other materials quality materials. A bag of good quality tile adhesive costs around £35 and in most cases at least 4 bags are needed. The tanking membrane usually costs around £100 (a small price to pay for the security it offers).Labour then needs to be taken into consideration too. Total cost is different for every bathroom as there are simply too many variables to consider so it’s best that we taylor your quote specifically for you rather than give you pie in the sky figures here. No one likes mess so dust sheets are provided on all carpets and walkways. Doors are kept closed to avoid dust spreading and we’ll keep the work area as tidy as possible. At the end of each working day the sheets are taken up and all tools etc are tidied away and the work area is hoovered. The hoover is also used throughout the day for dust control. They shouldn’t be as dustsheets are provided. Obviously they will vacuumed each day but there shouldn’t be any damage. Can I Have A Shower Pump Fitted At The Same Time? If you find that your hot water pressure only offers you a dribble of a shower then a shower pump can be fitted to increase pressure. A good shower pump can often serve more than one bathroom so other showers can be added to the system meaning a better showering experience for everyone in the house. A 12 month workmanship guarantee is offered on all bathroom installations. This does not cover the suite or associated fittings (such as taps, shower valves etc) as these are usually covered by the manufacturer. You will find that not many fitters are confident enough to offer a 12 month guarantee. Do you Supply The Suite? Yes. We only fit products that we have supplied. As there is so much competition on the internet for cheap suites there has been a drop in quality. 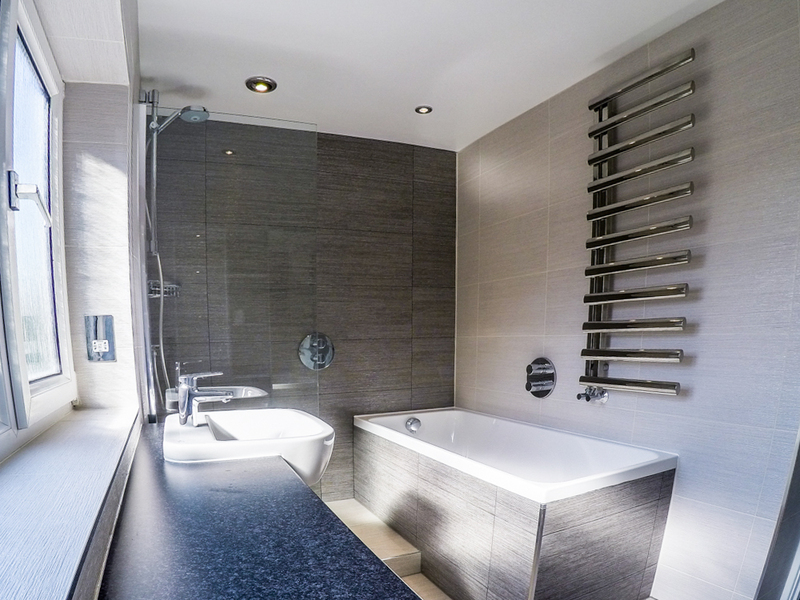 We want you to be happy with your bathroom so we will only ever recommend and fit products from established manufacturers with a proven track record in quality and after sales service. I Already Have The Suite. I Just Need A Fitter. Can You Help? We only fit bathrooms where we have supplied all of the goods. Helping you get the most out of your new bathroom is what we strive to do. We will offer recommendations on what products will fit best in your bathroom and meet your expectations. You Have Mentioned Tanking. Is This Necessary? 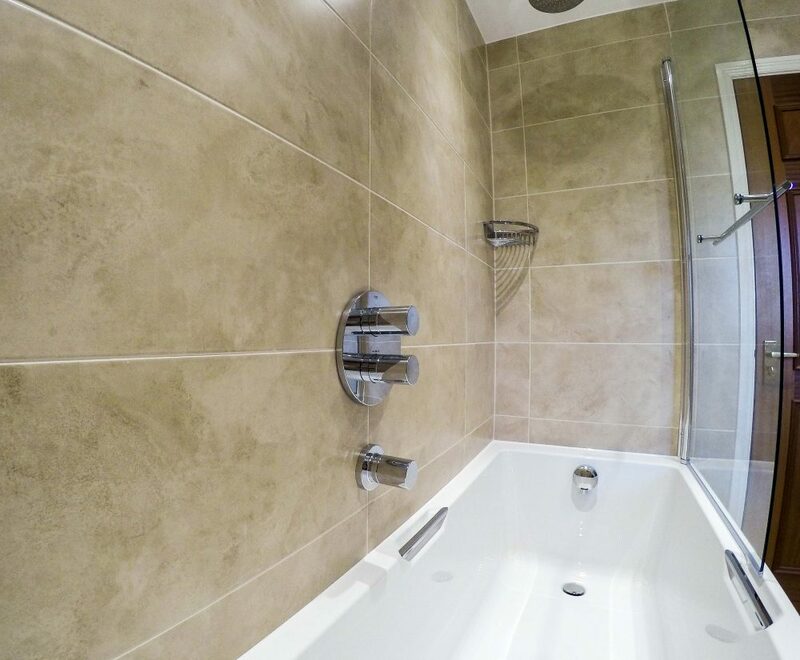 Tanking involves fitting a waterproof membrane before tiling to wet areas such as showers. Tanking stops the chances of water damage to the background surface such as a plastered wall. Tiles are usually waterproof but grouts aren’t. Grouts are advertised as waterproof but this simply means that they do not degrade in the presence of water. If you find that your current bath or shower area has lots of black mould growing along the grout lines then this usually means that the wall beneath the tiles has been water damaged. Tanking does not cost much but it can save a lot of disappointment in the future. Do You Use Quality Fitting Materials? Yes. Obviously quality fitting materials cost more but your bathroom needs to look good for a long time to come. It is simply not worth skimping on cheap materials to save money. We certainly wouldn’t be confident enough to offer a 12 month guarantee if we used inferior materials. During the fitting there will be small amounts of time when the water needs to be turned off in the early stages. Isolating valves are normally fitted to individual pipes in the room allowing us to turn the water on and off just for the bathroom and not the whole house. Will I Be Without A Toilet? For most installations the toilet is one of the last items to be fitted but if you need a toilet at the end of each day we can always temporarily plumb it back in until final installation. Will You Stay On The Job Until It Is Finished? We make a point of staying on the job until it is finished. This means minimal interruption for you and quicker payment for us! Past customer have always commented on how detailed our quotes are in comparison to competitors. Typically a quote is usually around 4-7 A4 pages long and describes all of the work that will be carried out section by section. This means that you know exactly what you will be paying for. Any extras during the installation can be added but have to be agreed by both parties. Are you able to deal with the electrics? 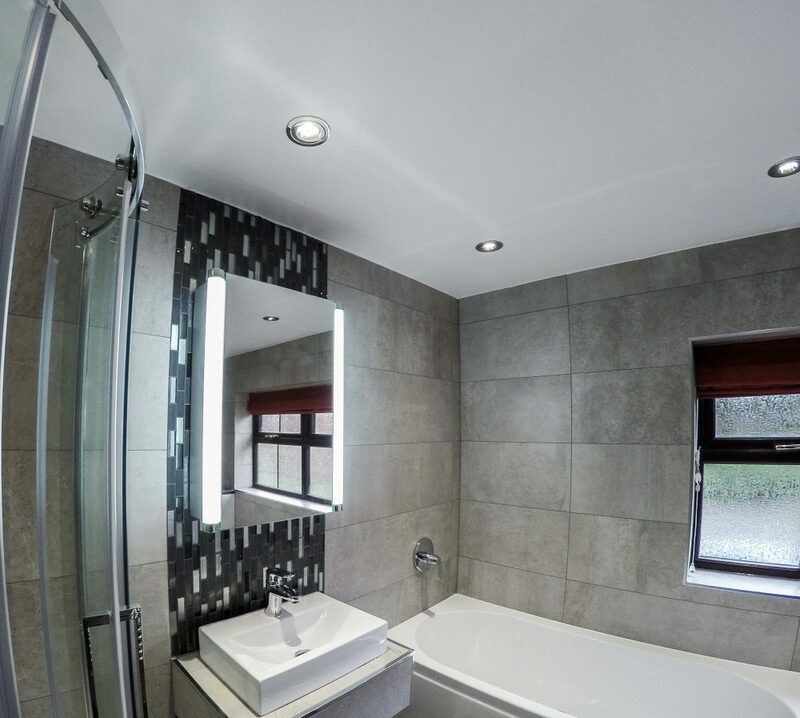 Most bathrooms require some form of electrical work to be carried out and often enough planning the new bathroom is the best time to consider new lighting such as downlights or possibly a quiet extractor? We don’t fit the electrics ourselves as this would be illegal so we use qualified certified electricians. We arrange for all the work to be carried out (usually on the first day) and a safety certificate is issued by the electricians directly to you. The cost of any electrical work is included within your quotation saving you the inconvenience of finding a reliable electrician yourselves. Will you take all of the rubbish away? All of the waste from your old suite and materials required during installation are put in the skip that we supply.